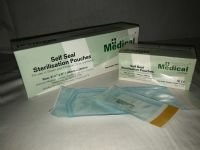 Sterilisation Pouches - for use in autoclave. Manufactured in the UK by Granton Medical Ltd. 200 pouches per box. Our Self Seal Sterilisation Pouches are the market leading product in the UK, either in Granton® branding or in own label packaging. When we started to manufacture Self Seal Sterilisation Pouches, we took an innovative approach and commissioned unique, high speed, fully validated plant. This enables us to produce at exceptionally high speeds, whilst ensuring our production is 100% free from critical defects. For added peace of mind, we manufacture our self seal pouches in our Class 10,000 Cleanroom facility, exceeding the requirements of ISO 11607-1:2006. Our sterilisation pouches are manufactured under ISO 13485:2003 Quality Systems. Manufacture of custom sizes and own brand labelling undertaken by arrangement. Self Seal Sterilisation pouches differ from traditional Heat Seal Sterilisation Pouches or Reels as they feature a self adhesive strip which, by removing the backing and folding over, creates a validated seal that will withstand sterilisation. The self seal system thereby cleverly eliminates the need for heat sealing equipment which can be expensive to purchase, service and validate and which takes up precious surgery space. Furthermore, by following the simple self seal instructions, a uniform seal is achieved each and every time - ensuring no waste, and providing a validated process! Granton® Self Seal Sterilisation Pouches are available in a range of standard sizes, as well as in custom sizes by arrangement.